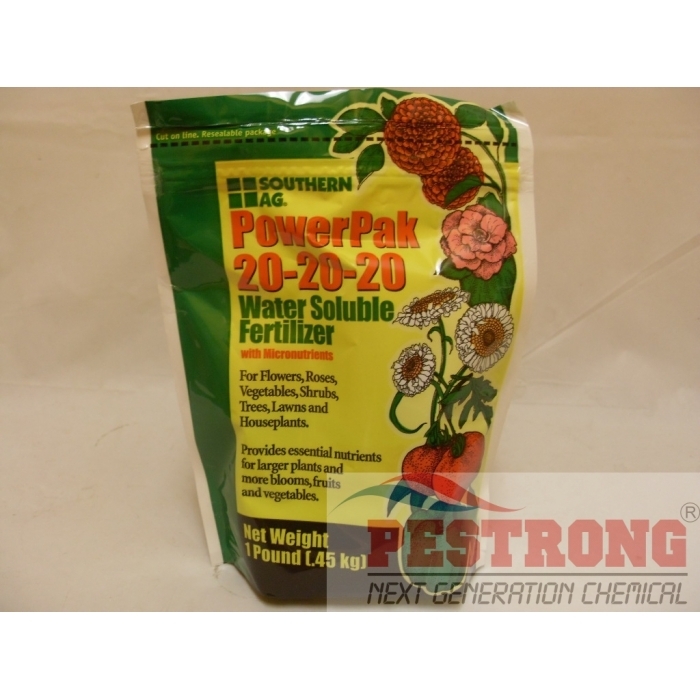 Where to Buy PowerPak 20-20-20, PowerPak 20-20-20 Water Soluble Fertilizer - 1 - 5 Lb - $9.95 for Sale with Fast Free Shipping! 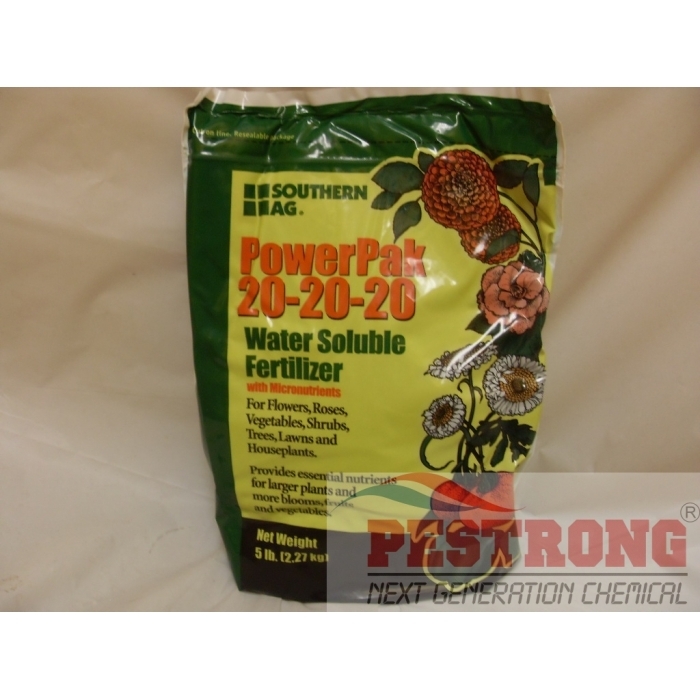 PowerPak 20-20-20 Water Soluble Fertilizer with micronutrients - 1 - 5 Lb is a great fertilizer for Flowers, Roses, Vegetables, Shrubs, Trees, Lawns & Houseplants. 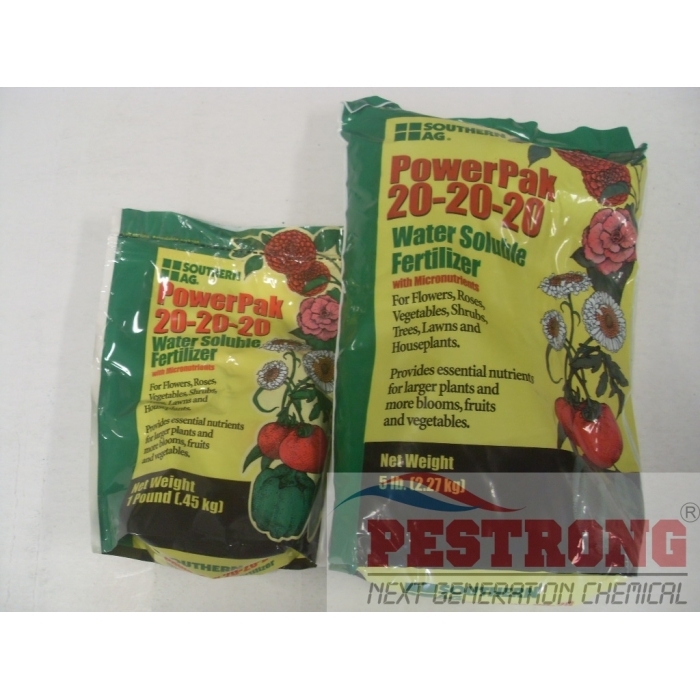 SPRAY APPLICATION: On Vegetables, Tobacco, Ornamentals, House Plants, Shrubs and Trees. Use 5 lbs. per 100 gallons of water (2 TBS. per gallon). Apply as a full volume spray. Repeat at 7 to 10 day intervals as needed. 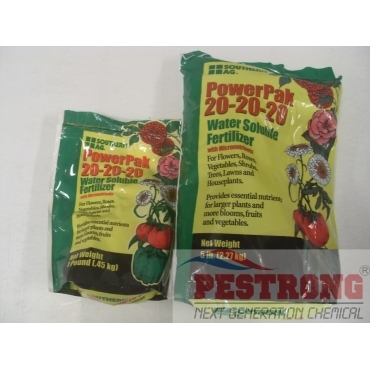 DRENCH APPLICATION: On plant beds and potted plants, use 2 lbs. per 100 gallons of water (2 tsp. pergallon). Apply at the rate of 1 quart per square foot or 100 gallons per 400 square feet. Repeat treatment every 1-3 weeks as needed. CONSTANT FEED: Fertilizer applications with every watering (3 or more times per week). Use at the rate of 100-200 ppm nitrogen, 6 3/4 oz. to 13 1/2 ozs. per 100 gallons. Water with approximately 1-2 quarts per square foot or 100-200 gallons per 400 square feet (4/10 - 8/10 in. of water). Where injector systems are used, the following table may be used to determine the amount of fertilizer to use in concentrate tank. When constant feeding, it is often desirable to leach potted and benched plants about once a week in order to avoid excessive fertilizer build up, particularly on the soil surface. LAWNS AND TURF GRASS: May be used as a supplement to regular fertilization when quick response and greening are needed. Use at the rate of 1 lb. per 10 gallons of water per 1,000 square feet. Apply monthly or as needed. TRANSPLANT SOLUTION: For use on tobacco, vegetables such as tomato, lettuce, cabbage, cauliflower, eggplant and peppers. In general, use 3 lbs. per 100 gallons of solution (1 1/2 TBS. per gallon). Pour around plant using 1/2 to 1 pint of solution per plant. Some plants such as tobacco may be sensitive to excess amounts of fertilizer and it is best to use the low rate of 1 lb. per 100 gallons initially and check plant response. If experience dictates, up to the 3 lb.rate may be used. This material is compatible with most insecticides and fungicides which are not highly alkaline such as Bordeaux Mixture or Lime. Works well, good price. Solid product. I never worried about fertilizer over my garden with use 20-20-20. Completely soved in water. easy to use. I recommend use over garden.